HiltonHead.com » How healthy is red wine? How healthy is red wine? In the early 1990s, the “French Paradox” made headlines, and began the trend that put red wine in a healthy light. The paradox was that the French had lower death rates from heart disease in the 1980s than countries such as the United States and the United Kingdom, even though they had similar rates of smoking, high blood pressure and consumed diets high in cholesterol and saturated fat. Doctors suggested the reason could be that the copious amounts of red wine they consume protects from heart disease. Critics denounced this study citing that before the 1980s French diets consisted of much lower levels of cholesterol and saturated fats. Since these dietary changes were so recent, the consequences of the poorer diet did not have time to make a difference. However, a similar study conducted a decade later showed results similar to the 1980s study, making the critics argument tougher to prove. In 1995 Danish researchers found that, among 6,000 men and 7,000 women, those who drank three to five glasses of wine a day had a 49 percent lower rate of death over a 10-year period. Drinking the same amount of beer was not associated with lower death rate, and three to five glasses of hard alcohol increased the death rate by 34 percent. However since the researchers did not look at lifestyle factors, is was possible that wine drinkers live longer because of other lifestyle choices, such as eating healthier or exercising more. Therefore this study was deemed inconclusive. However, another 29-year-long study showed red wine drinkers have a 34 percent lower mortality rate than beer or vodka drinkers. It has been know for quite some time that the tannins in red wine contain procyanidins, which is known for protecting against heart disease. But it wasn’t until 2003 when scientists started getting excited about another ingredient, resveratrol (found in red wine, berries and chocolate), that could extend the human lifespan by 30 percent and help to remove chemicals responsible for causing blood clots, which is the primary cause of coronary disease. 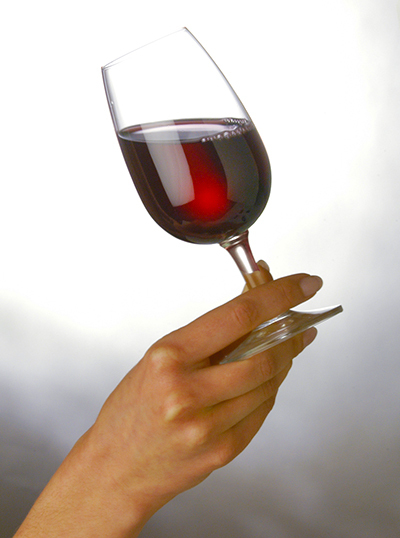 A daily dose of red wine cuts blood clot-related stroke rates by 50 percent. The story of red wine and cancer has been a complicated one, but it took a turn for the worse this year. In the past, studies have suggested that red wine may be able to reduce the risk of prostate, as well as lung and colon cancer, but probably only for light to moderate drinkers. A preponderance of research suggest that heavy drinking, increases the risk of lung, colon, liver, stomach and breast cancers. Regardless of all the ever-changing scientific data on red wine and health, one constant has been the correlation between good health and overall happiness. So if a glass or two of red wine a day paired with a great meal, enjoyed with friends or to just decompress after a stressful day contributes to your happiness, then drink up. Cheers!